Use food processor to chop onions. Make sure not to make a paste of onions.Wait a few seconds before opening food processor to give the tiny gas droplets produced by cutting the onion a chance to settle. Chilled onions produce fewer tears. Keep onions in the fridge for a few minutes before cutting. Cut onion near cold running water to wash away the irritants before they can make it up to your eyes. The root end of the onion has the largest concentration of sulphuric compounds that make your eyes tear. You can reduce tearing when cutting onions by first cutting off the top, then peeling off the outer layers, leaving the root area intact. You can also use glasses to protect your eyes from the onion vapour. Eat chewing gum while cutting onions. This way you will be using your mouth more than your nostril to breathe in thereby reducing inhaling onion vapour. 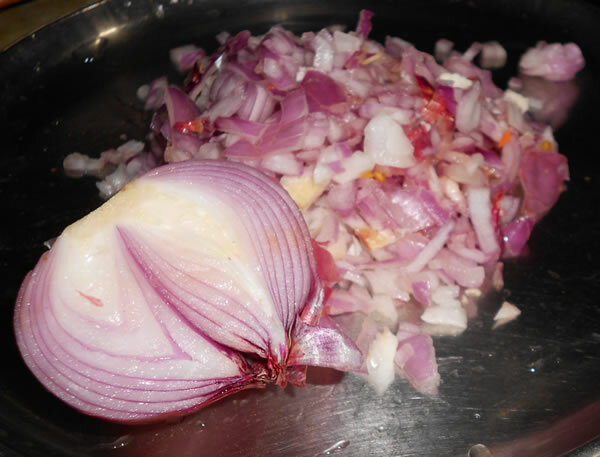 Cut onions into 2 halves and keep it in cold water for few minutes before chopping it.